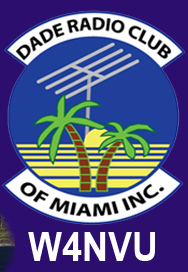 February – W4NVU – Dade Radio Club of Miami Inc.
Meeting was called to order at 19:22 with 40 present. We have a quorum. Julio presided over the meeting and welcomed everyone. The meeting was not broadcast live on the air tonight from the EOC. There was testing being conducted in another room tonight. Everyone took turns and stated their name and call sign. Julio welcomed everyone again. Steve Taylor will give a presentation tonight. Julio reminded everyone present tonight to sign in. Miguel introduced a special guest – Julio Hernandez AD4Z who is the Best World Wide DXer. Everyone welcomed him. We had no minutes to approve from last month. Corresponding Secretary: Lloyd had nothing new. Treasurer – Brianna advised that a radio amp was sold by the club for $500.00. We almost broke even at the Hamboree. She is also collecting dues for 2015. Website – Julio advised that he is redoing it. Photos from the hamfest will be put on the site. Club Elmer/PIO – Miguel advised that ARRL is happy our hamfest and it was success. Newsletter – Julio advised that if you have anything to get it to him. We are looking for writers. He will have time to release the new edition soon. Merritt spoke about the Hambulance and the progress that has been made and what still needs to be done. Miguel presented Carl KA4HLO with the Mentor Award from ARRL. He is the go to person for everything. Congratulations Carl! Lloyd spoke about a tower trailer that he went to see in Miramar. He offered $500.00 for the trailer. It comes with a generator and two towers. It needs 5 tires and rims, which would cost roughly $200-$400. The rest will be manual labor. We will use the $500 that we got from the amp which was sold by the club. Therefore, it will be no cost to the club. The trailer needs painting. This will be less work than the hambulance. It will be hitched to the hambulance. A motion was made by Miguel to purchase the trailer, seconded by Lee, a vote was taken and the motion passed. Hamfest – 2015 Tropical Hamboree. Lloyd thanked everyone that volunteered their time and efforts. Hamfest almost broke even. After the show he received all types of thank you’s and great success. The show was a total success. We will have another one next year. The tower is paid for 2016. It will be the 50th Anniversary of Tropical Hamboree. For the mini maker fare, Dani took over and did a great job. The maker side burned us. Lab Miami did their own maker fare the same day and cancelled with Meg Media. Lloyd accepted taking over the Hamboree for next year. Thank you Lloyd. Sunday, February 22, at 2PM at David’s house will be the final meeting for the 2015 Hamboree. Two plaques will be presented to Miami Dade CERTS and City of Coral Gables Police Explorers for their amazing assistance that they offered to us. There will be three raffels for free tonight. Everyone will get a ticket. Miguel thanked Lloyd and there was a round of applause. Julio spoke about the ISS contact that was made and featured on Ham Nation with Richmond Heights High School and Middle School. This was possible thru the Everglades Club and DRC. Thru ham radio the students were able to speak to the astronauts. It was a great event! Field Day – John will be the chairman. More information TBA. The 147.000 – Miguel advised that its down right now. The 147.760 – Ray advised its working well. Not much traffic. Still having some minor problems. The 224.200 – Julio advised that the new site will be at Miami High. The 444.200 – Carl said its working sometimes. The Digipeater – 144.390 – Merritt advised that he is working on it. Emergency Committee – Miguel yield to John McHugh for a presentation of a plaque from Yeasu to DRC for appreciation and support and contribution. We also received 5 gold metals from ARRL. John also has a fund raiser – 12 free pizzas for $10.00. Net Manager – Brandon advised that the 146.700 is business as usual. He is exploring other modes. Steve gave a presentation on tracking working satellites and making contact with them through the radio. These satellites move at 17,000 mph. Awesome presentation! Testing – Dave advised that we have 3 new techs, Luna Novel, Horacio Javier Unzeuta and Martin Perez. One person who received his tech at the hamfest received his general tonight. It was a good session and congratulations to everyone!!! Armando advised that the Red Cross is having an open house Saturday, March 14 from 10 AM to 1 PM. Info will be posted on the website. Miguel announced that he received a call tonight of ham equipment for sale. See him if you are interested. Miguel announced that Julio, who has participated in the US DX Olympics representing the USA will do a presentation for us in the future. There will be an emergency management meeting before our regular meeting next month. Next meeting’s show and tell will be on go kits. Julio asked if there was any new business. Lloyd updated us on Andy’s condition. He is awake, up and walking and in great spirits. Thank you to all for your thoughts and prayers. Marty announced that he just joined our club and has the upmost respect for us. Thank you Marty. Door prizes were drawn: Mike Jurskglski won the game. Tom Little won the connectors. Frank won the duel band antenna. Congratulations to all! Miguel made a motion to adjourn, seconded by Lenny. The DRC meeting was adjourned at 20:57.